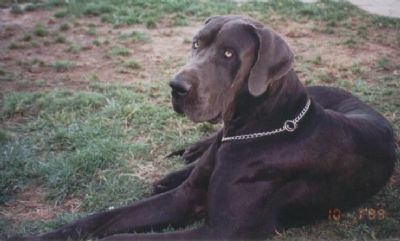 Charlie was my first great dane. She was a very active and athletic girl, even in her golden years. She was an excellent jumper and would often jump out of the yard with a 6ft fence to play with the kids in the park nearby. One of Charlie's most noted characteristics was her smile, when she was happy she would run up to you with her mouth wide open, teeth showing and make a weird snorting noise, many visitors were frightened by her warm greeting . She was the boss and educator of our yard....she was an excellent foster mum to the new puppies that entered our lives she taught them essential manners that would get them through life and some sneaky tricks to get more treats out of mum and dad. The river was a favourite playground for Charlie, she would love to come swimming with us and meeting up with some of the local dogs. Charlie was a huge part of lives and our memories of her will never be forgotten. Todd was the definition of a gentle giant. He loved other dogs, cats, people and especially trees. Todd had a fascination with low lying trees and would slowly sneak under the branches of trees, sometimes pausing, with them gently massaging his back, it was a doggy form of meditation. Todd started his show career with a bang taking Baby puppy in group, at his and my first show. 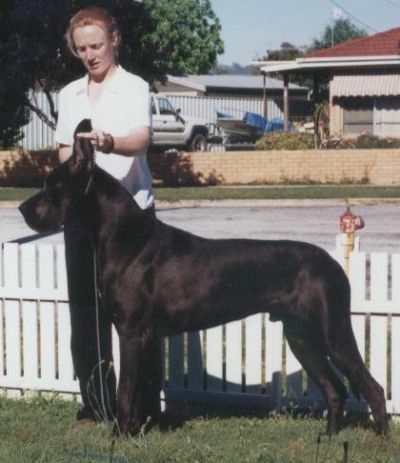 Over his show career he attained his Aust Champion title easily with numerous Best in group, R/U best in group and class in group awards, no mean feat for a coloured dog. While I was still showing Todd, my husband had begun showing our first pug Aust.Ch. Gailyn Court Jester, Todd could often be seen mingling it with the toy group, he had a fascination for anything small and to see him bow down to play with a Chihuahua was a sight to behold. Although not as boisterous as his soul mate Charlie, Todd was always there for a cuddle when you needed him. Neo was a charming, gentle giant, who drew attention where ever he went. Neo had a fetish for toys and shoes. Most of Neo's photos showed some sort of toy or shoe hanging out of his mouth. This made finding your work shoes at 6 am in the morning a challenge, as they were never where you left them. 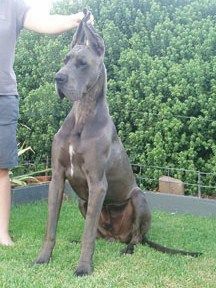 Neo's other hobbies included playing soccer, tug-o-war, swimming & giving cuddles.